The NWOSU Art Society was officially welcomed to Northwestern in the Fall of 2004. The purpose of NAS is to encourage, stimulate, and maintain an excellence in the field of art at Northwestern Oklahoma State University. Our goal is to heighten awareness both on campus and in the community of the many cultural backgrounds and talents of the students, through which all will foster a synthesis of the appreciation, knowledge, and awareness or art in all styles and mediums. To promote creativity, have fun, try different mediums, expand our knowledge, make friends, and serve our community. For any questions or more information, contact sponsor Angelia Case at (580) 327-8577 or arcase@nwosu.edu or in Fine Arts 211. "A University without the Arts has no soul." Keep up with discussions in our Facebook group! 16th Annual Art Show coming Spring 2019! Start planning now! 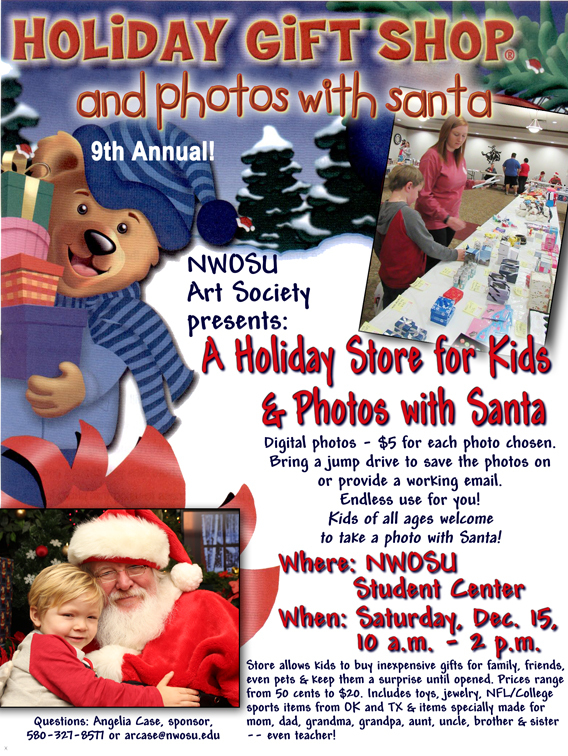 Holiday Store and Photos with Santa coming up Dec. 15! Keep up with news about the show on our Facebook Art Show Page. The NWOSU Art Society offers fans of Ranger basketball opportunities to win baked items at home ballgames. At every Goodie Giveaway, NAS members also will be accepting dorm-friendly non-perishable foods for the Campus Cabinet food pantry as well as monetary donations. Set-up always occurs one hour before the first game begins, so that means noon for Saturday games and 4:30 p.m. for games during the week. We need people to bring items and two people to work the table. Timing of giveaways: 1) women's halftime, 2) between games, 3) men's halftime. We try to have 21-30 items for each date because there are three drawings for a double-header game. For single games, we'll only need around 10 items. Please let us know if anyone outside the club would like to volunteer to bring goodies for our fundraiser! We really appreciate it! For our members without access to ovens, food items that can be created without needing an oven or burner...but maybe a microwave... can be found at Recipes for non-baked items for fundraisers. Pinterest is a great resource to find fun and easy no-bake items. Each December members of the Art Society and other volunteers offer a Holiday Gift Store for Kids and Photos with Santa event. The event began in 2010 and has been held on the Saturday that follows the last day of finals in December.